A great design for those wearing any neutal nudes, black, cream, white or navy tones. 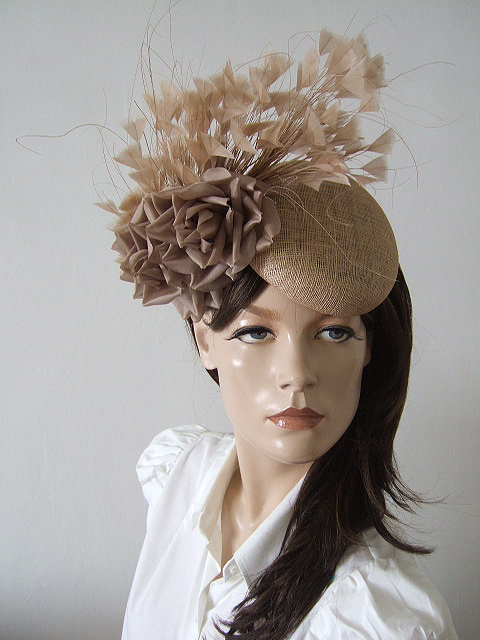 This is a Teardrop Natural Straw coloured Sinamay Headpiece, with two large Silk Roses in Taupe, and a large spray of upside down arrowhead trimmed goose feathers. Headpiece sits at an angle with the teardrop sitting above left eyebrow, with the Flowers and Feathers on the right hand side of head. Teardrop Measures 6.4" x 5.25", and floral arrangement height 11.5".